NASA has released new images of Ceres taken by the Dawn spacecraft. Not only is the detail astonishing, but the resolution may help our understanding of the enigmatic dwarf planet. The image above is of Haulani Crater. At 34 kilometers (21 miles) across, it is far from the largest crater on Ceres, but it&apos;s distinctive as one of the freshest geological features. 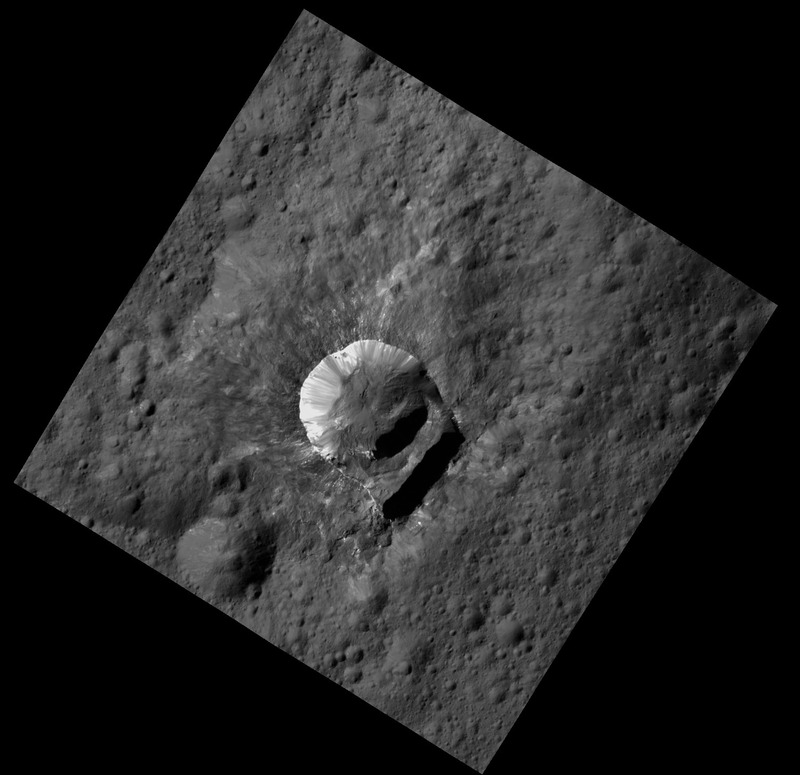 It was taken when Dawn was still in its high-altitude mapping orbit, about 1,480 kilometers (920 miles) above Ceres. Spectacular as this image is, better was still to come. Since then, Dawn has moved into its final orbit, 385 kilometers (240 miles) above the surface, from which height it can see objects 35 meters (115 feet) across. Although Haulani&apos;s brightness makes it interesting, the blue color seen in the top image has been enhanced. 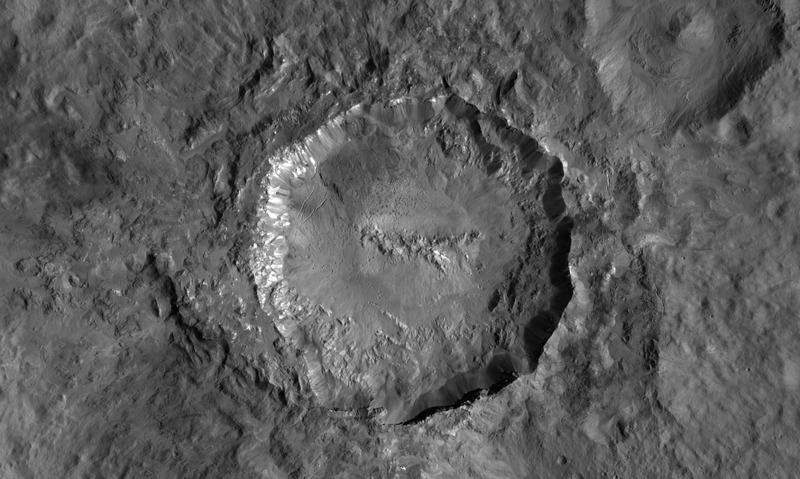 Dawn has detected similar coloring around other young features on Ceres&apos; surface. "Haulani perfectly displays the properties we would expect from a fresh impact into the surface of Ceres. The crater floor is largely free of impacts, and it contrasts sharply in color from older parts of the surface," said Dr. Martin Hoffmann of the Max Planck Institute for Solar System Research, Germany, in a statement. Without the color enhancement used for the high-altitude image, Haulani looks less striking, but planetary scientists appreciate the even closer look at the strangely straight lines around the crater&apos;s rim, which turn Haulani into a polygon, rather than the circular shape of most craters. The other highlight of the recent set of images is Oxo Crater. Only 10 kilometers (6 miles) across, Oxo is the second brightest object on Ceres, after the central area of Occator Crater, which is so bright Hubble detected the anomaly before Dawn&apos;s approach. Most Ceres maps place Oxo near the edge, so it is less familiar to non-specialists than some other features. 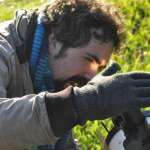 Besides its brightness, Oxo has attracted attention from scientists for the large section known as a “slump,” where material has fallen below the surface. Minerals on the crater floor appear to have a different composition from the rest of Ceres, prompting considerable interest in more detailed images.